Terre Blanche Golf Resort describes itself as a “Land of Inspiration in Provence.” In my mind, a reasonable claim. Even though it’s the French equivalent of Saint Andrews, I’m not only here for the golf. The club house and elegant surroundings are crammed with stylish contemporary sculpture. And big names too. 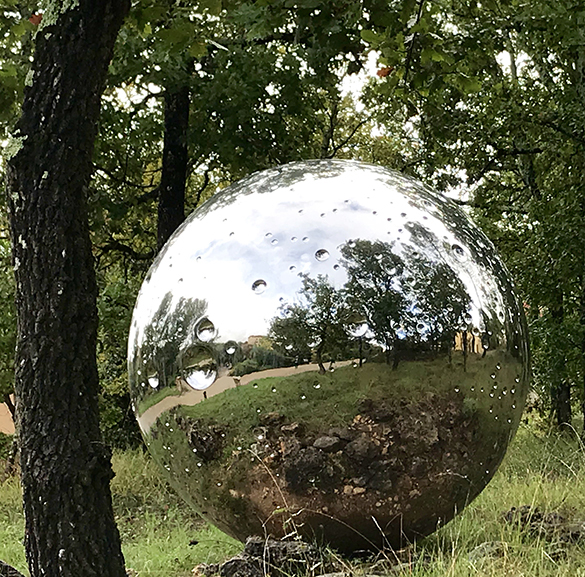 However, despite the best efforts of the helpful staff, nobody can tell me the provenance of something that really captures my attention: a huge silver-steel-shiney orb sitting among some stunted oak trees that line the path down to the first tee. It is entirely out of place and all the more intriguing as a result. The object’s surface is covered with randomly spaced indentations of varying size; they are clearly meant to recall craters. It reminds of the first time I used a high powered telescope to look at the moon the surface of which is entirely covered by evidence of asteroid impacts. I read once about the “impact events” that have affected planet earth. Apparently, every 500,000 years an asteroid of more than 1km collides with earth; one of over 10 kilometres hits us every 20 million years (and extinguishes most life forms.) The reason that these craters are less obvious on earth as compared with the moon and other planets is simply because of water; many hit the sea and the signs of those that have had a terrestrial impact are slowly ground down by atmospheric erosion and plant life. Fascinated, I wander around this lonely planet. I lay on a hand; the brilliant surface is smooth and very cold. On touching it with the tip of my nose, I detect a faint but definite metallic odour. I tap this beautiful sphere with my knuckles and am treated to a deep and distant resonant clang; it’s not a forest noise. Finding this sculpture here, completely discordant with it’s earthly surroundings, augments the other-worldly feel it gives out. Form and placement together result in an immensely satisfying piece of work. Does anyone know whose work it is? Or did it fall from the sky?